I don't know, if this is a Problem from PHPStorm only, or I I made a mistake. 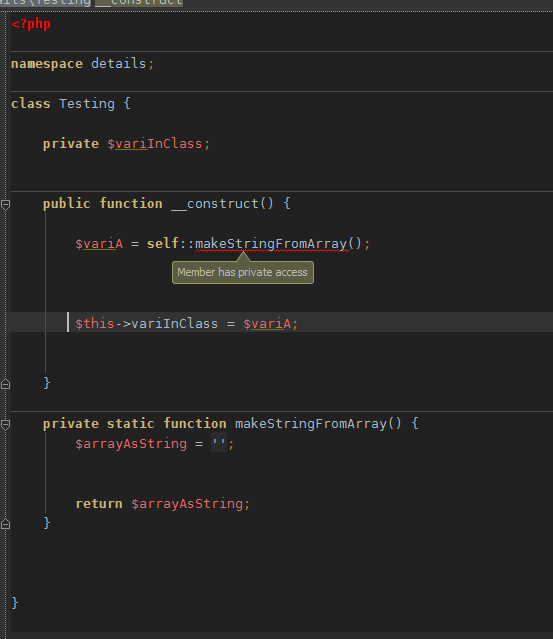 Is it allowed to use a static private function in an __constructor? PHPStorm sometimes shows an error. And if I want to refactor the methodename, PHPStorm didnt find the other name. Jörg, what is your PhpStorm version? I can't reproduce the issue nor in PhpStorm 5.0.4 neither in the latest EAP. Is it a consistent problem? it is still in 126.97 (I have regonized it in the EAP before). It is not always shown. I tryed to refactor the class. I clicked on self::otherName(); and I got an Error in the IDE (see below). Important: after I creating the testfile with the testclass, you have to save the file (STRG-S) and then make some changes in the file. For example I insert a few blank lines after the constructor. This bug is fixed and will be available in the next EAP.